Set in the picturesque wine-producing valley of Franschhoek is this small luxury Cape Winelands country hotel, offering guests luxurious accommodation. Franschhoek Country House is a restored manor house and former perfumery dating back to 1890. This Cape Winelands country hotel is situated on the outskirts of Franschhoek and is surrounded by enchanting vineyards and majestic mountains. 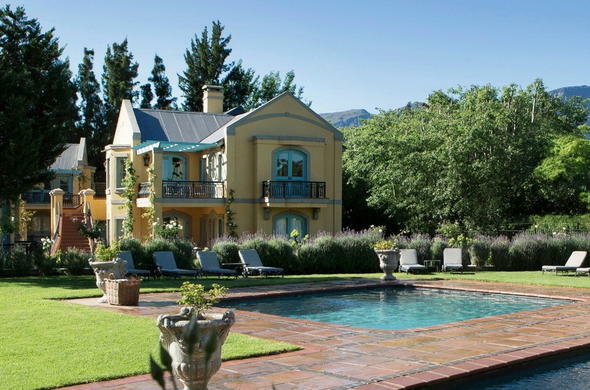 Franschhoek Country House is only an hour drive from the city of Cape Town. Ths elegant Cape Winelands country hotel offers luxurious accommodation in beautifully appointed rooms, suites and cottages. Guests can look forward to delicious meals served on the veranda or enjoy dinner at the in-house Monneaux Restaurant, rated as one of South Africa's top restaurants. Guests can enjoy exploring the surrounding winelands and the village of Franschhoek. Taste some of South Africa's best wines at the numerous wine estates situated nearby. Franschhoek is home to award winning restaurants and an array of shops. The club house at Franschhoek Country House offers excellent conference facilities. The club house can also be used as private dining facilities.